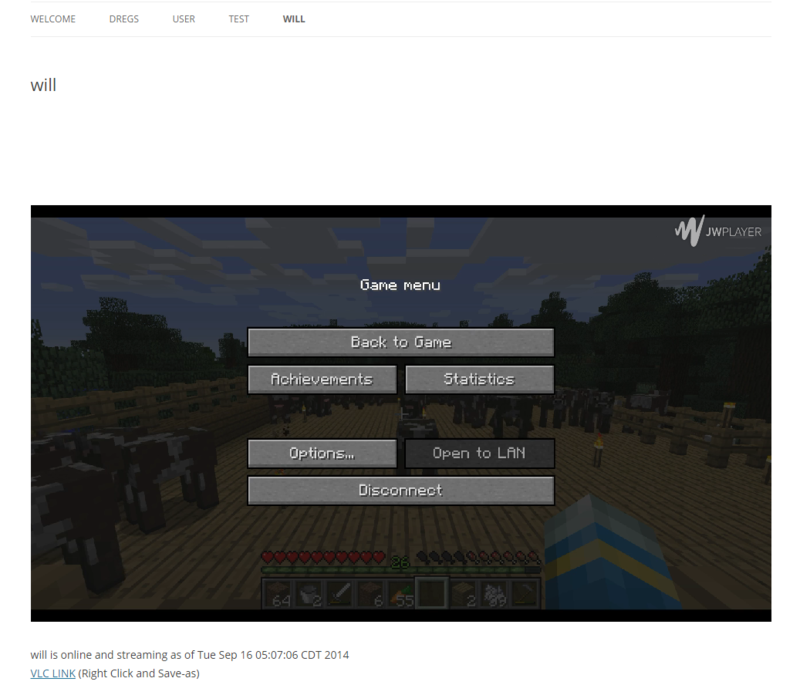 I am starting a mini-series of posts on how to set up Nginx-RTMP and WordPress to create a local version of Twitch.tv. I will post detailed guides on installing and configuring all software required for this project. 1 or 2 Linux computers/VMs. All testing has been done with Ubuntu Server 14.04 64bit. Nginx-RTMP with the stats plugin compiled. Various command line utilities that will be covered in depth during the guide. The end product will be a fully functional streaming server capable of handling 1gbps of video traffic, with a custom WordPress frontend for users to use to access the streams. The entire system is automated and requires minimal user input. A basic use-case is below. Bob wants to stream his Dota game for the entire LAN party to see. The LAN has a limited bandwidth internet connection, so using a service like Twitch.tv is out of the question. However, the LAN execs have configured a local RTMP solution for him to use. 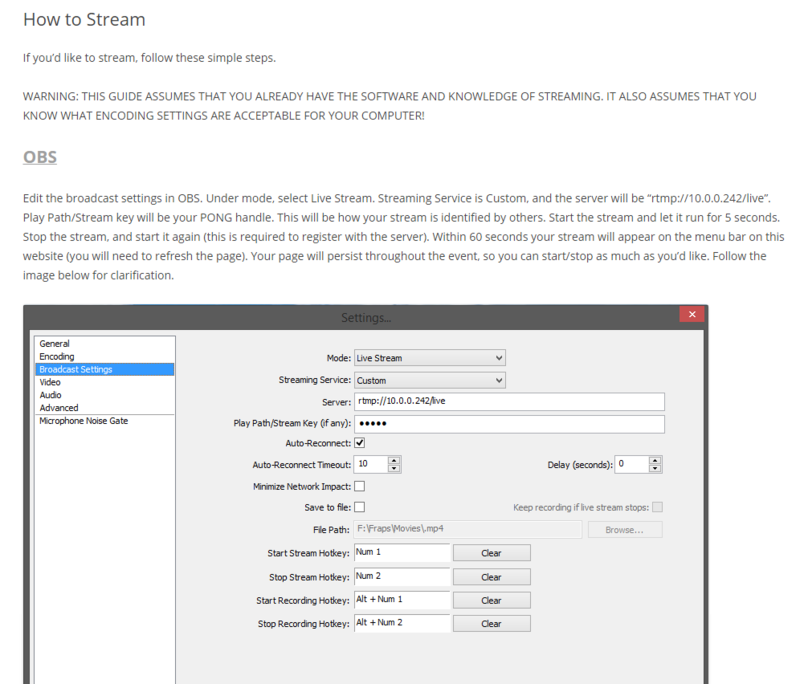 Bob configures his streaming software like he would normally, except he points his stream to the local RTMP server. He uses his gamer handle (b0b) as a stream key. At this point, Bob’s job is finished. He can start playing his game. On the backend, a script reads that a new stream has started. It checks to see if this stream has been played before, or if this is a new stream all together. 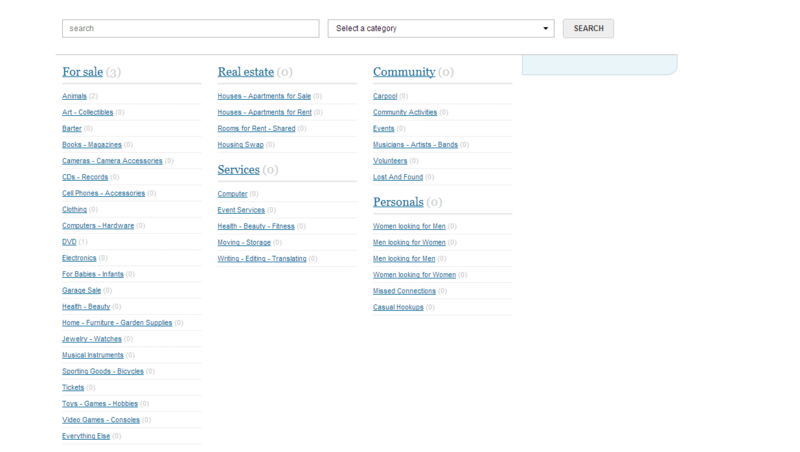 If its new, it adds the stream to the local database and creates a page on the WordPress site dedicated to Bob’s stream. It then runs through every stream that has been registered to the server during the event. 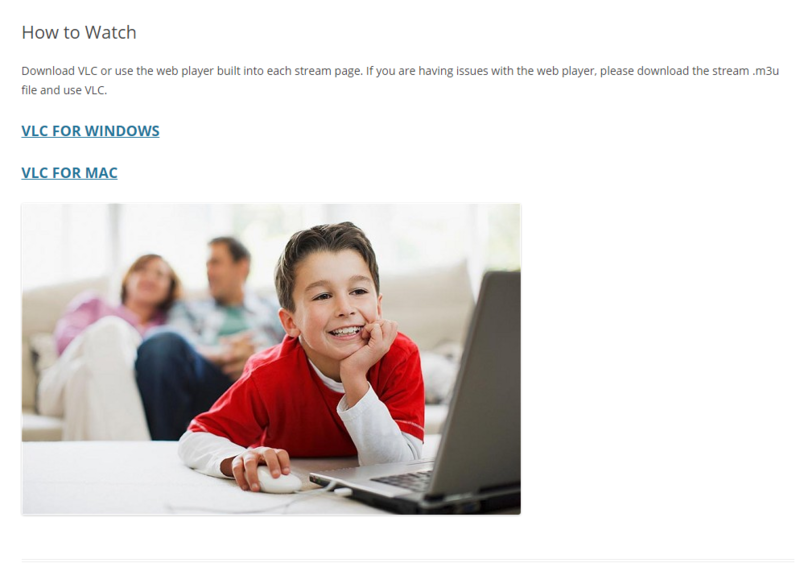 If the stream is active, like Bob’s, it updates the page with a JWPlayer configured specifically for Bob’s stream. It also generates an .m3u file with a playlist entry pointing towards Bob’s stream mount point. Viewers can just navigate to Bob’s page on the WordPress site and start watching from within their web browser. If some of the previously registered streams are offline, it updates their page with an offline message telling users to check back soon. By using this process, every single page is updated every 60 seconds via a cronjob. So that’s a basic overview of what this setup can do. It can listen for, create, and distribute live RTMP streams to viewers automatically and painlessly. And because all traffic is local, no internet bandwidth is wasted for redundant connections to websites like Twitch.tv or hitbox. I will be making many more posts about how to set this up for your own event, so stay tuned. If you have any questions or comments, please leave a message below. Part 1 – Install nginx rtmp tutorial here! 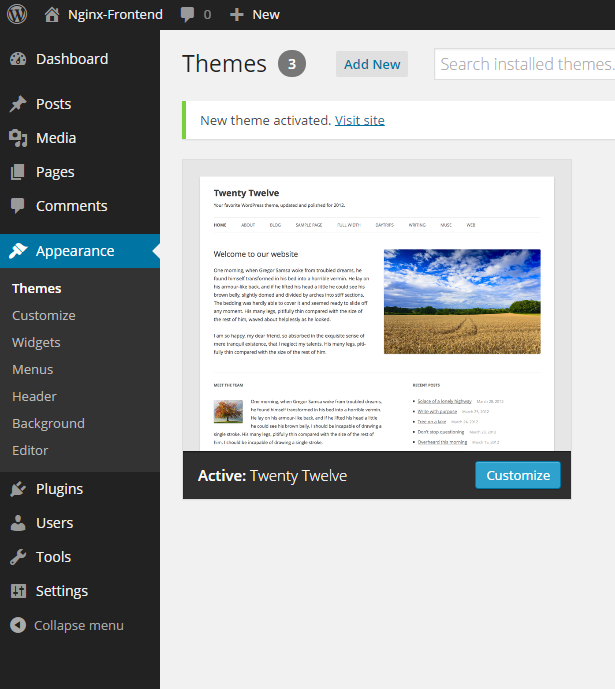 Part 2 – Customize WordPress tutorial here! 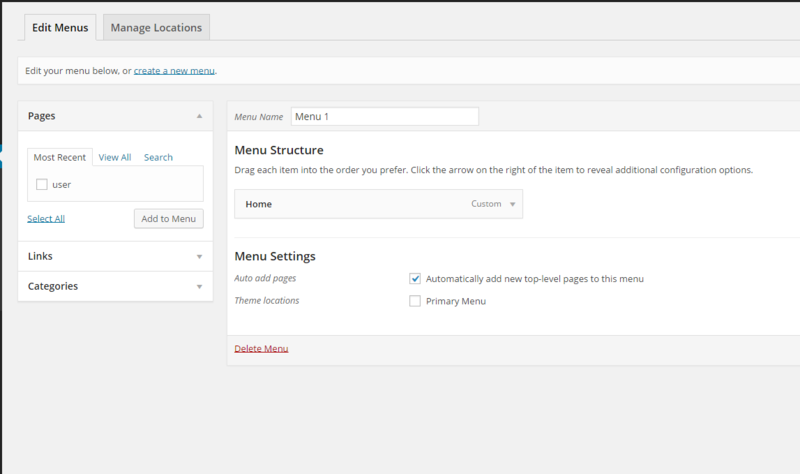 Part 3 – Finishing the RTMP WordPress Project here! Part 4 – Virtual Machine Download here! This entry was posted in bash scripting, Game Servers, Nginx-RTMP, Servers, Ubuntu on September 9, 2014 by will. It worked great until the end. Upon running the script, SSH session would get flooded with errors. At first it appeared that they were Java errors, but upon further inspection it appeared to be related to my SSH session itself. I was using SecureCRT, and by default some of the color codes from the Linux terminal are not enabled. Here is the error I was getting. McMyAdmin Core Exception: Argument cannot be null. 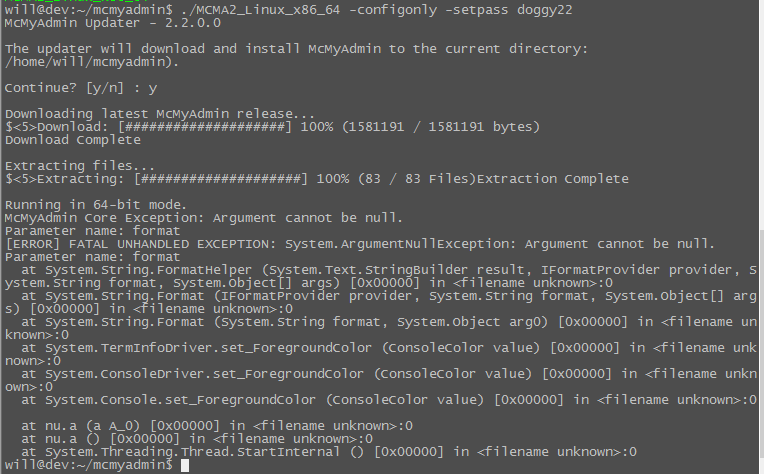 [ERROR] FATAL UNHANDLED EXCEPTION: System.ArgumentNullException: Argument cannot be null. As you can see, its all talking about colors. 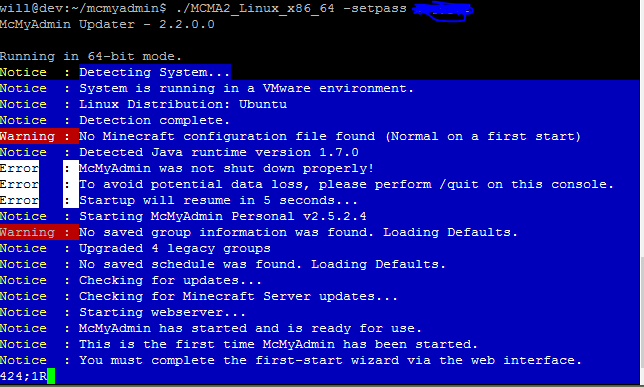 Mcmyadmin attempts to mirror Powershell in its color scheme, and that includes changing the background color to blue. For whatever reason SecureCRT doesn’t allow for this to happen, and the result is a bunch of errors. By switching to Putty, I was able to get the server up without an issue. I’ll include some screenshots below to show what I am talking about. SecureCRT throwing an error while connected. Putty working fine. Notice the blue background. I hope this post helps anybody having issues with this problem. I couldn’t find anything online that helped. Comment below if you have questions. This entry was posted in Game Servers, PC Gaming, Servers, Tutorials, Ubuntu on August 24, 2014 by will.